Dark under eye circles can make you look tired, sick, or even worse- older! Nobody wants them and yet most people have them. Whether it’s from lack of sleep, allergies, genetics or an unhealthy diet, those pesky circles seem to appear overnight and are extremely resistant to change. Thus, we have consolidated 9 helpful tips that will have you looking less like a panda, and more like a rested, younger version of yourself. Don’t wash your face with hot water. The hot water and steam will only increase the puffiness and highlight your dark circles. So, cool it down and use lukewarm water instead. Even though dark circles can be caused by a variety of things, lack of sleep and bags are infamously connected. Be sure to not only get the rest that your body needs, but to also sleep on your back at an incline, this will prevent fluid from accumulating under your eyes. The skin under the eye is very thin, making it more susceptible to UV damage. Carefully apply sunscreen under your eye daily. Our Prevention + Daily Matte Moisturizer SPF 32 is the perfect solution, because it works as both a sunscreen and a makeup primer. Apply a well-formulated eye cream twice a day. 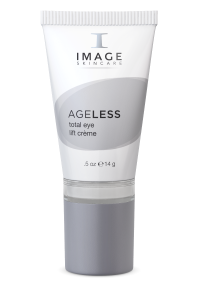 Our Ageless Total Eye Lift Crème uses Retinol, a Vitamin A derivative that fades pigmentation and increases collagen production, reducing fine lines while making the skin less transparent. After you’ve hydrated with eye cream, apply a concealer. Avoid concealers with a yellow tint, as this will only highlight the circles. Instead, use a concealer with a peachy undertone to neutralize the blue hues under your eyes. Apply using your ring finger or a foundation brush, and remember less is more. Try our I Conceal Flawless Foundation for full, buildable coverage that’s actually good for your skin! If there is one thing worse than dark circles, it’s those painfully obvious white concealer circles. Be sure when using concealer to blend, blend, blend! Start at the inner corner of your eye, near your tear duct, and blend down the sides of your nose. And be sure to follow-up with a loose powder, again patting it on with your fingertip or a small brush. Using white eyeliner on your bottom water line will make your eyes appear bigger and brighter, and cn help to make dark circles less noticeable. Stay away from food high in sodium, and be sure to drink plenty of water. Invest in an oil free makeup remover that will easily remove the makeup around your eyes. If you have to scrub, it will only cause irritation and capillary damage, causing more puffiness and darker circles.